I remember walking past an end-of-terrace house once and peeking over the wall to look at the garden. It’s a habit I’ve still not shaken. I was instantly astounded at the quality of the lawn. I’d just that week watched Gardener’s World and they had interviewed a chap who supposedly had one of the best lawns in the country. This was definitely better! Then, looking closer, I realized that it wasn’t grass at all. At least not of the traditional type. Artificial grass can be an easy-to-maintain, inexpensive alternative to traditional turf. This is especially the case in small-space patio gardens where it can act as a cover for ugly concrete. And, as my little story illustrates, it really can look like the real thing. Until closer inspection, at least. In this concise guide I’ll offer some general buying advice. I’ve also reviewed five inexpensive and high-quality grasses available from Amazon. Picking the best artificial grass, whatever your situation, isn’t that complicate and this article should be enough to get you started. If you’re a stadium groundskeeper, however, then it probably won’t be of much use! Click here to jump to the reviews. 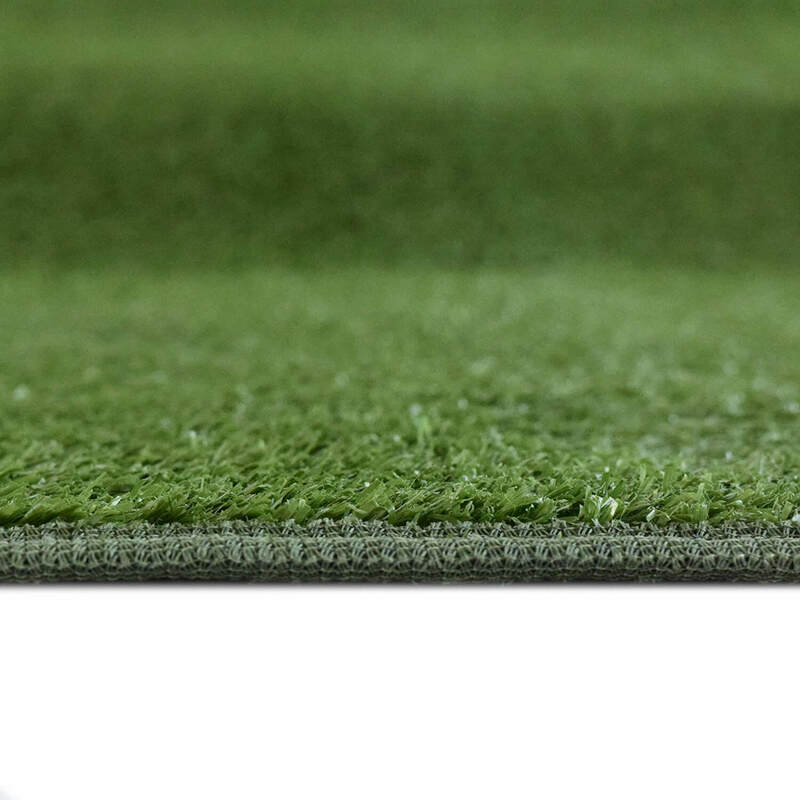 Just what is artificial grass made of? 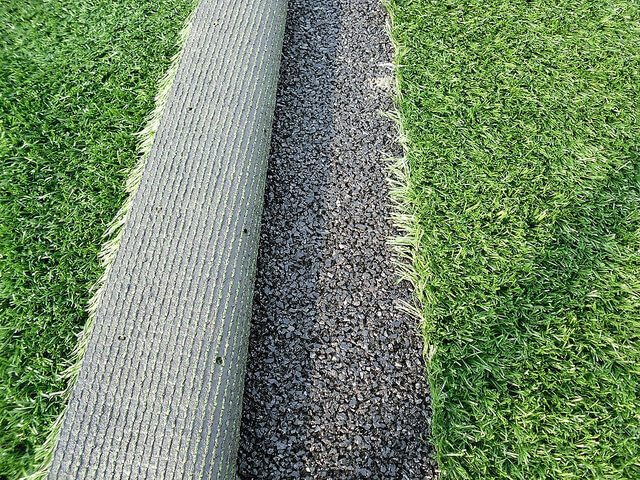 There are usually three components to artificial turf. 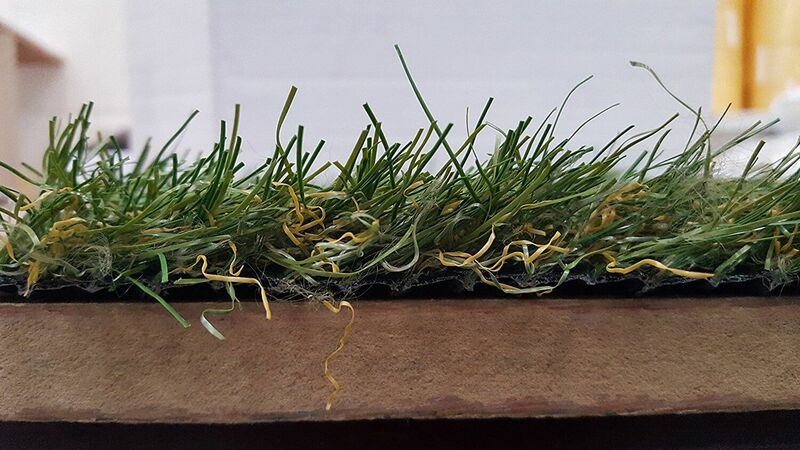 Much like a carpet, there is a resilient lower layer, often made from latex, some type of “foam” material in the middle to provide cushioning, and finally the actual grass blades, made from a plastic such as nylon or polypropylene. Drainage holes will also be incorporated into all of the layers. The higher you move up the price spectrum, the more durable these materials become. The cost of artificial grass is anywhere from £15/$20 – to £30/$40sq. metre. Below £15/$20, you’re really looking at lower quality display grass, of the type used by greengrocers. It’s rarely designed for heavy footfall. Is it difficult to lay? Short answer: no. It’s lain in much the same way as traditional turf. What it really needs is a flat surface. Small spaces are the obvious choice for a DIY approach. If you’re covering a larger area, there are obvious benefits to paying a professional to do the job. They’ll level the ground, install a weed membrane if it’s necessary and make sure it’s all joined up and fixed down properly. Nonetheless, laying yourself is completely viable. The cost of getting it wrong isn’t likely to be severe and it’s a relatively simple process. Most brands advertise as being suitable for self-laying. This grass from Pet Zen is very thick. As mentioned, in the case of sizeable gardens a draining material will be applied to the surface of the soil, a weed membrane placed on the top, and the grass held down by nails. In the case of concrete or paving stones, either glue, heavy objects or ornaments can be used. Often, sand, which is brushed into the grass to help it remain upright, can also provide additional weighting. 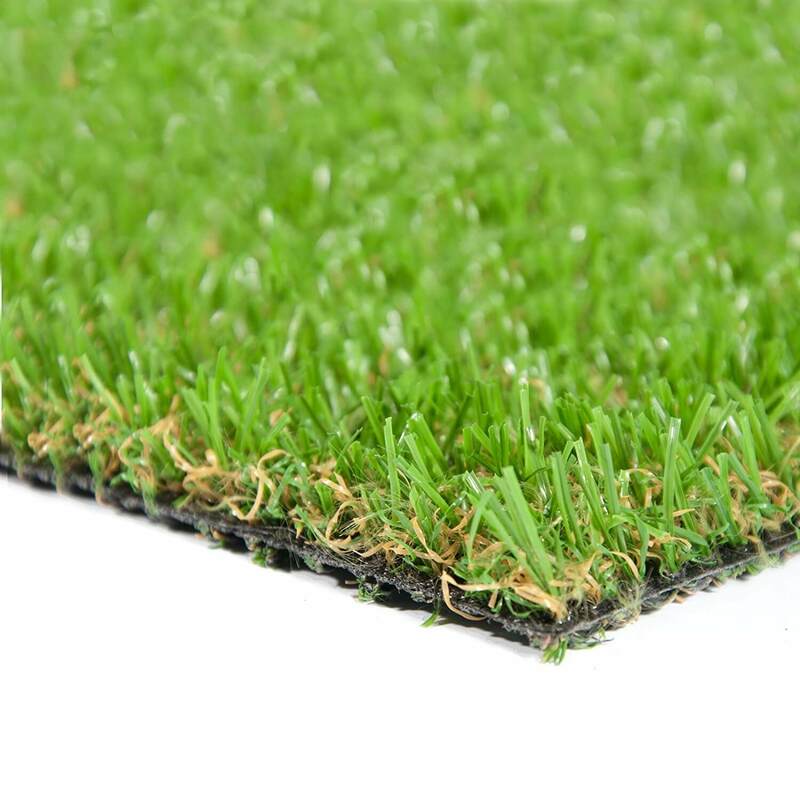 Do you need to a “sub base” to prevent the artificial grass from sinking? If you have soft or marshy ground, you may need to make it more robust. Do you need a membrane? If the area you’re planting in is prone to weeds, a good membrane will save you a lot of hassle. Is drainage an issue? To prevent pools of water from forming, sort out drainage before laying. Will pets be urinating on the lawn? While this is unlikely to cause any problems, you may need to invest in odour-eliminating products. Will you be having lots of barbecues? If the answer is yes, make sure the grass you opt for is resistant to burns. The same is true for chimineas! Generally speaking, cleaning is quite easy. After large pieces of debris have been cleared, leaf blowers are usually recommended as the best option for cleaning. Moss-killer (that may or may not be designed specifically for artificial grass) is also usually applied. Beyond this, water from a hose pipe is usually sufficient. Sand may need to be replaced if your fake turf gets a lot of wear or if it’s often very windy. With Amazon’s superb refund policy, there’s no reason not to consider having a sample delivered. If you’re only covering a small area, as I imagine those gardening in a small space are, then this is probably be the easiest way. 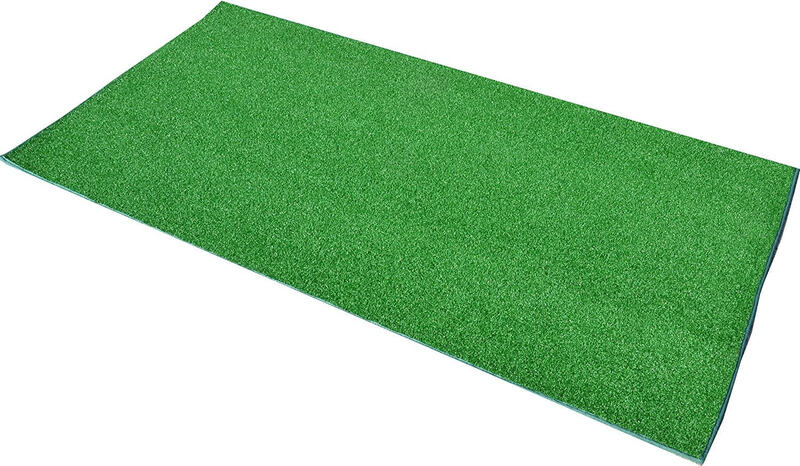 This artificial grass from Pet Zen, which also happens to be the most popular fake grass on Amazon, is a good all-rounder. It’s inexpensive, comes in a range of sizes (so you can buy a small piece to test) and is very weather-durable. Another great thing about this grass is that it’s been purposely designed to deal with pets. The polypropylene blades won’t absorb any urine. It has an all-round lush feel and the rubber base is very durable. This is a good option for those that want a “closer cut”. Whilst it will fare well if staked to the ground it can also be rolled up and stored for occasional use. It’s a great, UV-resistant option for patios and balconies. It also comes in a huge range of sizes, so you can get one that’s just right for your space. If your grass is just for display purposes, for placing pots or ornaments on, then this inexpensive option may well be your best bet. Reviewers cite good water resistance (so there’s no trouble from run-off when watering pots) and a high degree of weather durability. Many use it for balcony and container gardening purposes, so you will be in good company. it’s typical “green grocer” grass (my grandfather used to run a fruit and veg stall so I’ve got particularly good memories on that count). This is a high-quality grass that’s designed to be as functional as a traditional lawn. You can buy it in a range of sizes and it’s perfectly suitable for self-installation over a larger space. It’s 35mm thick and particularly hard wearing. The grass is also UV protected, so there won’t be any unnecessary “sun fading”. I think the design, with different colours of blades is a nice addition that adds to the realism of the “pile”. It has a latex backing with drainage holes, doesn’t require sand granules to be spread over it to sustain shape, and is fully child and animal safe (click on the photograph for specific information). 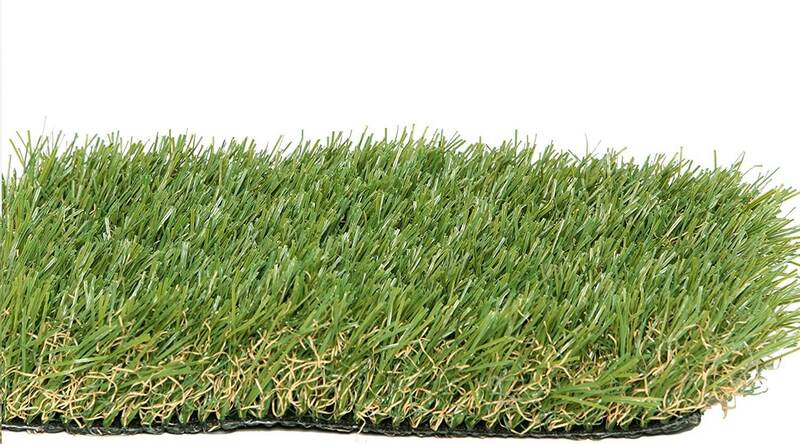 Another high-grade grass that has more of a “clipped” feel: where the “Oslo” grass is 35mm long, this is only 22mm. If you’re in the market for a shorter grass, with a slightly greener look (see the picture), then this may be the one to go with. The addition of off-colour blades gives the grass a more natural feel. It’s fully draining, UV protected and doesn’t require any sand. Perfect for self-installation and available in a huge variety of measurements. Have you tried any of the recommendations in this article? Leave a comment below and let me know! Which of your choices is the coolest in summer for Florida heat and has drainage holes? Is nylon backing cooler than the polypropylene? Hi Audrey! So generally speaking lighter coolers are cooler and fabric is better than plastic as it doesn’t absorb much heat. That said, there are several fake grasses on the market at the moment that have special cooling technology so you might want to check those out.